My name is Carly Fulton. I am a Licensed Massage Therapist, and I have been practicing massage therapy since 2013. I received my education from the Connecticut Center for Massage Therapy, where I completed the 720 hour Therapeutic Massage Program, and earned my board certification from the NCBTBM. I am also a proud member, in good standing, of the AMTA. I continue to follow my passion, and learn more about massage therapy and the holistic healing arts every day! I brought my practice to California in 2015, and now promote wellness out of Historic, Downtown Ventura. I specialize in Deep Relaxation Massage, Deep Tissue Massage, chronic neck and shoulder pain, and relieving tension headaches associated with neck and shoulder imbalances. Butterfly Kisses has now added Butterfly Kisses; Faerie Hair! Check it out here! 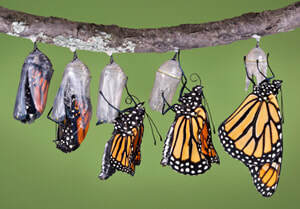 Butterflies signify change, metamorphosis, rebirth and transformation. Specifically from humble to great, or bad to good. 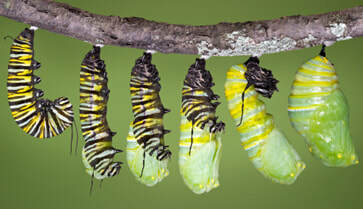 The little, helpless caterpillar becomes the beautiful, flying-freely butterfly! For my practice, with regular massage and a holistic lifestyle, my clients can transform from a place of dis-ease to a wonderful place of wellness and health! Flying freely without pain and dysfunction! I have always been fascinated by, and in love with butterflies! As a little girl, my father would give me "Butterfly Kisses" with his eyelashes on my cheeks. Since his passing in 2009, Butterfly Kisses has become a way of life for me. Keep growing, learning, changing, transforming... My way to share that with the world is through massage and holistic healing.